The circular nodes represent the attributes and the texts on the edge represent the values the attributes can take on. 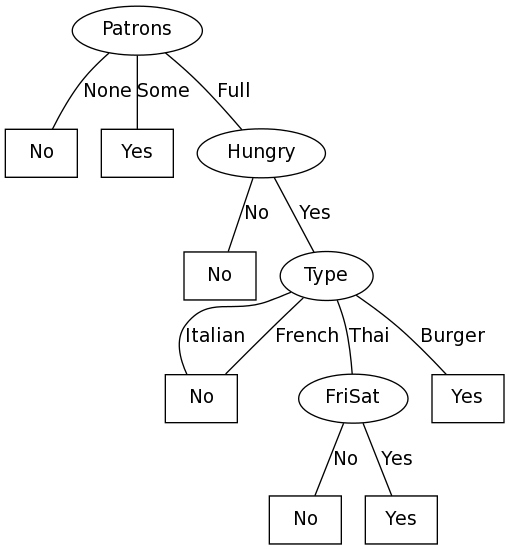 The leaf nodes represent the final decisions given the data. In this restaurant domain, when (1) the patrons are full, (2) you are hungry, (3) the restaurant type is Thai and (4) it is a Friday night, you would decide to wait for the line. The simpler example input in question 18.6 is also available.